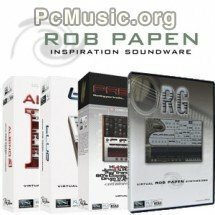 Time+Space launch a competition : to celebrate the forthcoming release of Rob Papen's new virtual synth RG, they have 3 complete sets of Rob Papen products to give away. All you have to do is answer a "very simple question". Each winner will receive a boxed copy of Albino 3, Blue and Predator as well as a copy of RG when it is released. You'll also get a limited edition Rob Papen t-shirt.